I hope the first week of the new year has been treating you well. I've been pretty busy with school but have made it my mission this weekend to do a bunch of crafting! Since its a new year, you might had made it a goal to craft more, try a new type of craft or possibly make your first craft project ever! With that in mind, I thought it would be fun to write a blog post about some craft hacks that could make your crafty live easier. For those of you who may not know what a ''hack'' is, its basically a technique or tip which can be use to make your life easier. So today I wrote down 20 of my favorite craft hacks which I frequently use in my own crafting. Some of these hacks I learned from other crafters/bloggers and some of these hacks I've just been doing out of habit for years. 1. Use your nail file as a mini sander. 2. Sharpen a hole punch with tin foil. 3. When your getting to the end of a glue bottle, grab a glass jar thats the size of your glue bottle and flip the bottle over (with the cap on) and place it inside your jar. This will allow the glue to work its way towards the glue bottle's opening and save you time from shaking the bottle just to get a small drop out. 4. Use toothpicks to clean up gluey edges on projects. 5. Use a teapot to hold your yarn while your crocheting. All you have to do is put your ball of yarn in the tea pot then feed the end through the spout. When your done just add the teapot lid. 6. Use a lint roller to pick up spilled glitter or beads. 7. Use bobby pins to hold things (like paper) together while glue is drying. 8. Use a blow dryer to get ride of hot glue gun strings. 9. Cut a slit into a piece of foam-board and use it to hold rings when decorating. 10. Have a hard time threading a needle? Spray the end of the thread with hair spray to make the thread stay straight. 11. When using glitter, work on top of an open file folder to catch fallen glitter so you can return it to its jar. 12. Don't have a stamp pad? Use your markers in place of the stamp ink. 13. Keep a gripper on hand to open up glue bottles or old paint bottles. 14. Save butter bowls for future water bowls for painting. 15. Use a blow dryer (on low) to heat up dull crayons to make them color brighter. 16. Use a magnet to pick up sewing pins. 17. Use cupcake liners to hold beads or glitter while your working. 18. Need a place to store your spools of ribbon or wash tape? Slide them on an embroidery hoop for easy organization. 19. Don't throw out those old magazines! Save them and use them for craft cutting mats when you need to use your craft knife. The magazine will be thick enough to protect your table while still giving you a place to do your cutting on. 20. Add a pencil gripper to your crochet hook to make it more comfortable to hold. My favorite hacks out of this list would definitely be number three and nine. 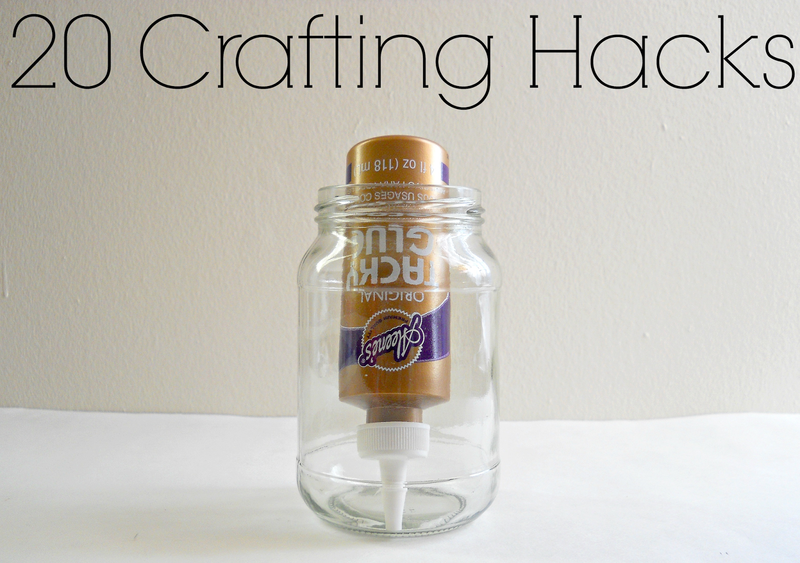 What is your favorite craft hack? Share them in the comments below! The teapot yarn holder idea is GENIUS! Thank you so much for sharing.